By looking at the cross references in the margin, it is easy to see that chapters were divided into lettered sections. This results in references like "Esa. 62.a" ("Esa" being the abbreviation for "Isaiah"), "Matt. 5.a", and "Deu. 28.g". 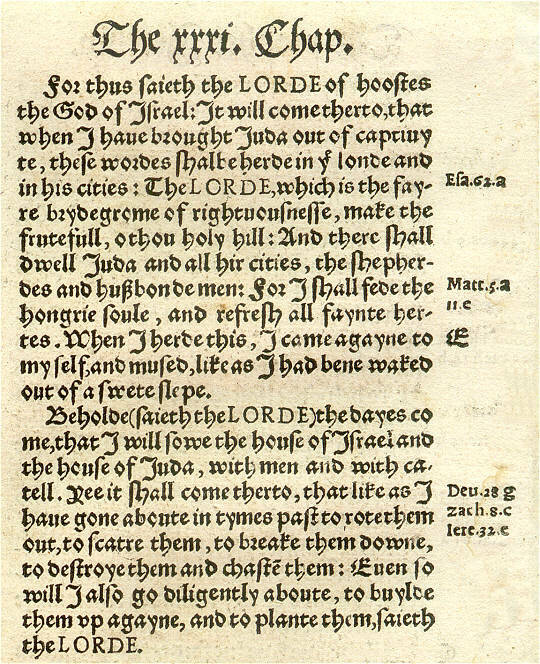 Note also the large "E" in the margin; this passage is "Jeremiah 31.e". If these examples are hard for you, check out our Old English Lesson at the bottom of this page. It will make reading these old Bibles much easier.